NEED IT NOW??? *Same Day Shipping from Brooklyn, NY to Atlanta, Ga. Heritage Printing is the one to call! Even with technology and communication at an all-time high, people forget things, lose materials, items get destroyed in transit or other people just don’t fulfill their obligation. These are a few of the unfortunate facts of doing business. We get calls regularly from convention vendors, ad agencies, event planners and promoters, with a need for super quick turnaround for signs Charlotte. That’s where Heritage Printing excels! *If we get approval of your proof by 10:30am, we can have your banner, backdrop or display in your hands tomorrow! Our turnkey process will amaze even the most impatient customer with unimaginable quality, error-free quick production and same day logistics. Charlotte is a hub for conventions, trade shows, meetings and events. Often time, circumstances mandate a rush order for marketing materials. We use your company logo (exact color matching available), print and process your order and deliver it to you on time for your event. We provide Speedy graphic design services. We have graphic designers that make the Heritage Expedited Services Process look easy as we deliver flawless designs ready for proofing and print, in extraordinary time frames. We are strategically & logistically located close to the transit hub of Charlotte. We are partnered with numerous shipping and delivery companies to provide the utmost speed and care in getting your product to you in Charlotte and most other locations in the United States. We will also personally deliver your marketing materials to your hotel, convention center or business in downtown Charlotte! From company newsletters & reports to magazines and perfect bound books, Heritage is the 1 to call for all your commercial printing needs. 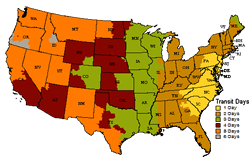 Click Here for more info on our Shipping Zones. of marketing materials in Charlotte!